Opening a Demat account involves a four-step procedure which is easy. But before going through the steps involved in opening a demat account, it is very important to get through the basics of demat account. If you want to start trading or investing in the stock market, you are required to open a demat account. This demat account stores shares in dematerialized electronic forms, unlike the way it was stored in physical forms previously. Opening a demat account involves a four-step procedure. But before going through the steps involved in opening a demat account, it is very important to get through the basics of a demat account. A demat account is opened to store dematerialized shares of your invested stocks in the electronic form with a Depository Participant. This Depository Participant (DP) is associated with either the NSDL (National Securities Depository Ltd.) or the CDSL (Central Depository Services Ltd.). To dematerialize securities and store them in electronic form. To rematerialize securities from electronic form to physical form. To add or update nominees. To invest in different securities such as bonds, exchange-traded funds (ETFs), mutual funds, shares, etc. To track and monitor the progress of assets. To get statements, including details such as transfers and current holdings periodically. To receive corporate benefits such as dividends, bonus, split, etc. To transfer assets, register Power of Attorney. 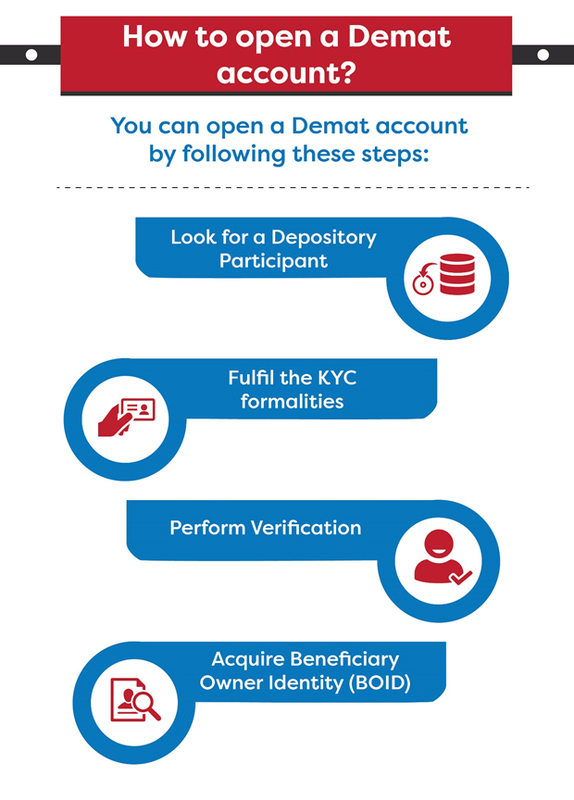 Look for a Depository Participant: The first step to open a demat account is to select a suitable Depository Participant (DP). A DP could be a bank, a broker, or an online investment platform. Make sure that the DP you choose fulfills all the necessary criteria and matches your requirements. To compare the various DPs, you could look for the list and other details on the CDSL and NSDL websites. Fulfill the KYC formalities: To register yourself with the DP and to open a demat account, it is very important to fulfill the KYC (Know your Customer) formalities. KYC formalities include submission of a duly filled application form along with the copies of required identity proofs. Verification: Once the application form is submitted along with the KYC documents, you might be required to be present in person at the DP’s office in order to verify the authenticity of the KYC. Acquire Beneficiary Owner Identity (BOID): Upon the processing of the application at the DP, a unique Beneficiary Owner Identity, commonly known as BOID, is generated. You need to acquire this BOID in order to make transactions and access your demat account in the future. If you are looking to trade in the share market on an intra-day basis, you would also be required to open a trading account along with the demat account. Proof of Identity: You would require copies of any of the following as a proof of identity. Proof of Address: You would require copies of any of the following as a proof of address. Time to find those documents and go open a demat account for yourself. Good luck!